Reverend Moon is both a visionary leader and a practical one who has founded the organizations, institutions, publications and service projects to make possible the ideal world of peace he speaks about. He began his mission resolved to end human suffering. Today he has projects and plans to solve every major problem facing mankind. Perhaps no other person has founded and funded so many organizations for peace and human betterment than Reverend Moon. His works touch nearly every area of human endeavor. In recognition of his tireless work of six decades to solve mankind’s most difficult problems, Reverend Moon also has a remarkable global network of friends, allies and supporters representing every religion, race, culture, nationality and profession. Many ask how Reverend Moon accomplishes so much. He says the most important thing is prayer. Before initiating a new area of work, Reverend Moon first invests many hours of study, research and reflection. He then outlines a vision for the work. Central to all of his vision is the core universal principle of living for the sake of others. Then he assembles people committed to this work. (His ability to inspire others to dedicate with him to worthy causes is legendary.) Working side by side with them from early morning until late at night, he challenges people to give their best. With this foundation, the work moves forward, builds momentum, and gains professionalism. The Universal Peace Federation ( UPF) and the Family Federation for World Peace (FFWP) are the two most central organizations founded by Reverend Moon. Founded in 1954 as the Holy Spirit Association for the Unification of World Christianity, the Family Federation for World Peace (FFWP) is Reverend Moon's own faith community or religion. People who accept and follow his particular religious teaching, the Divine Principle, are known as "Unificationists." There are members of the FFWP in 192 countries. 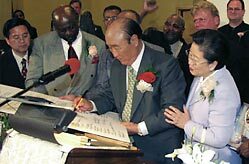 Until 1996, Reverend Moon's religious community was known as the Unification Church. 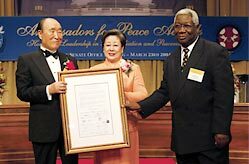 The Unification Church, founded by Reverend Moon in 1954 as the Holy Spirit Association for World Christianity, experienced one of the most intense religious persecutions in history.Today that persecution has largely ended. Read about the myths, controversies and truth about this new religious movement. His Works: Read about some of the remarkable organizations and institutions founded by Reverend Moon (a partial, representative list). A key social teaching of Reverend.Moon is that world’s problems will be best solved through interreligious cooperation. From earliest times, Reverend Moon invested more funds in interreligious work than in the development of his own religious movement. Today, post 9/11, his early vision of a world of peace through interreligious cooperation is prescient and more relevant than ever. Read about his work to bring the religions of the world to mutual appreciation and cooperation to solve the major problems of our time. With the passing of the Cold War and the events of 9/11, this age calls for fresh new approaches to pressing global issues. Reverend Moon believes that the inability to bring world peace stems not from a failure of systems and organizations, but from a moral and spiritual problem. Read here how he has gathered leaders of nations, regions and religions for forums, conferences and activities in the common pursuit of solutions to world problems. A visionary must institutionalize his vision if it is to continue beyond his lifespan. Read about the university, graduate schools and secondary schools Reverend Moon has founded to teach his vision and prepare youth for leadership in an era of mutual support, prosperity and peace among all people. Reverend Moon teaches that in the new civilization of peace, it will be artists who are the most respected members of society because their work stimulates the human heart. 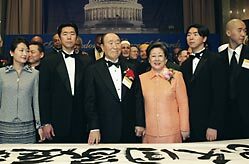 To initiate such a culture, he has founded major arts projects including one of the top classical ballet companies in Asia and one of the best ballet schools in the United States. Reverend Moon has a longstanding interest in the media. He has founded daily newspapers as alternative voices in the capitals of the United States, Korea and Japan. Why would a religious leader spend so effort and resources on media enterprises? His words: My ultimate goal is to achieve lasting world peace, a peace based on a true system of values. The achievement of this goal is far more likely to be determined by the work of the media than by military might. Reverend Moon teaches that we have arrived at an age when both the masculine and feminine perspectives are essential in all aspects of life. He predicts that increasingly women will be heads of state and says that the ideal congress or parliament would be 50% men and 50% women. In the Unification movement, his wife has an active leadership role, and Unificationist woman leaders play key roles. Read about the Unificationist organizations that avail themselves of women's unique leadership strengths. Reverend Moon teaches that the family is the school of love. The values that promote world peace are a direct extension of the values that promote peace in the family. Read about his works to promote the regeneration of the family as the cornerstone of a good society. Reverend Moon recognizes the central role and influence of scholars in leading enduring social change. Read about the organizations he has founded to encourage and support scholars to search for new ideas and methods of achieving peace and prosperity. A key teaching of Reverend Moon is that we are a global family. If one part of the family is in trouble, other family members naturally reach out to help. Therefore, he has founded numerous International service projects to meet emergency needs related to natural disasters, disease, poverty and war. His organizations and projects have brought hope and relief to millions across national, racial and religious boundaries. The energy and idealism of youth is essential to achieve world peace. Read about diverse youth activities founded to encourage youth to transcend barriers of ideology, nationality, culture, religion, race and gender in order to grow as citizens in the emerging global society. SPORTS: "PLAY SOCCER, MAKE PEACE"
“Play Soccer, Make Peace” is the motto of one of Reverend Moon’s major sport organizations. His vision is that the best place for nations to ‘fight” each other is on a playing field rather than a battlefield. He is a major promoter of world soccer, martial arts and other sports competitions. A little-known fact is the central role Reverend Moon played in the peaceful downfall of communism. Read about his decades-long, multifaceted approach to ending communism. Reverend Moon recognizes the value and importance of both the Eastern and Western approaches to medicine. 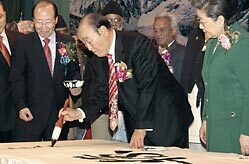 Therefore, he has funded pioneering educational programs in Eastern, Western and alternative medicine including study programs and two hospitals that practice the best of Eastern and Western medicine. From his own deep experiences with God on the ocean, Reverend Moon sees the ocean as a place to experience the Creator and the majesty of creation. He has set up ocean-based programs to challenge and train future leaders. "As we enter the age of internationalization and globalization of the 21st century, we are confronted with the urgent task of overcoming a large number of difficult obstacles to world peace. I have a plan that addresses the fundamental root of all these problems. I have dedicated my entire life to the pursuit of the will of Heaven based on this belief."